When I was a kid my family used to spend a week each summer at a lake near Brainerd, Minnesota, playing at the beach, catching turtles with paddleboats and fishing nets, going tubing behind my uncle Paul’s boat, and staying up talking with relatives around the campfire. For some reason I distinctly remember the sight of dragonflies on those vacations, and when I was a kid I was absolutely fascinated at these strange anachronistic creatures that looked like they were ripped right from prehistoric eras and placed squarely in our modern-day world. I remember seeing them buzzing around us when were out on the boat or sitting in tubes near the beach and being at once amazed and horrified by their strange design. Nearly 30 years later when my family was on vacation in Kansas a few weeks ago my brother Phil asked if I wanted to go bug hunting with him, armed with our cameras and close-up lenses. I gladly agreed and we set off near the beach at Milford Lake to go see what we could find among the foliage. He had a big advantage since he was using a 55-200mm lens with a +2 filter attached (I think. Or it might have been a +4.) that let him stay farther away from various bugs and insects but still take good shots. Far more, in fact, than I was able to get with my 50mm lens :) We were surrounded by not only dragonflies but bees, flies, beetles, and myriad other bugs but the problem, I soon realized, was that whenever I would get close enough to one of these little creatures it would scamper away by the time I could get things in focus and fire off a few shots. We were only bug hunting for maybe 20 minutes but I spent much more of that time chasing away insects than taking their pictures, and it was quite a learning experience for me in that regard! 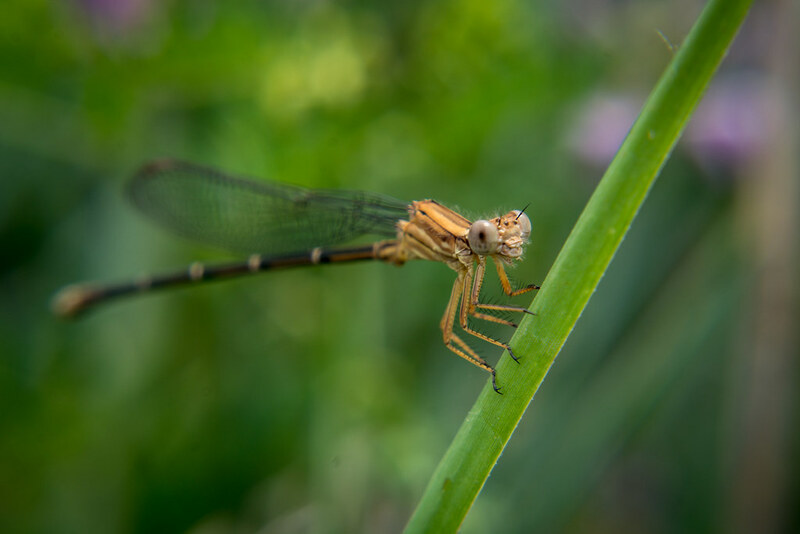 After a little while Phil pointed out the dragonfly you see in this week’s image, and after taking some pictures he stepped aside and I eagerly moved in to see what I could get. I was using my +10 filter which meant I had to be about three inches away, but this gold-colored dragonfly didn’t really seem to mind too much. In fact I don’t think he minded anything at all, judging by the look on his face :) I shot this at f/8, ISO 160, 1/180 second which was more than fast enough given that the insect wasn’t moving at all, and much smaller than f/8 would have given me a depth of field that was simply too shallow. As you can probably tell by the slate of recent pics here on Weekly Fifty I’m really enjoying these close-up filters, and if you don’t have some yet I’d highly recommend getting a set. They’re very cheap and can introduce you to a whole new world of photographic possibilities! Awesome picture, Simon! I love seeing God’s creation up close! Btw, in one of your last Weekly Fifty’s, you linked to an article you had written about back-button focusing. I’ve been using back button focusing, but didn’t realize that I could also use that to focus and recompose. That little bit of knowledge is saving so much time in composing – thank you for such a clear and useful article!! Best one I’ve seen… and he does look like he’s “hamming” for the camera!! That’s a great image, especially so physically close up. You should try bug hunting on the cool mornings that are hopefully coming soon. They don’t move so fast when they are cold, and sometimes you can catch them with dew on their bodies, which can make for some interesting bokeh if the light is right. Hey now…that’s a really good idea. I got this shot in the afternoon when it was probably about 90 degrees, and I don’t think I’ve ever really thought about getting some pics of bugs in the morning. It makes sense that they would move a little slower, and the light would be much better too. Thanks for the suggestion Rebecca! That is a great shot with a 50 mm lens! Question for you, is a close up filter the same as an extension tube? I have been trying these out and they are so much fun. I always enjoy your weekly photos and commentaries. I am impressed by your “dragonfly” shots. However I note that both insects have their wings folded back at rest. True dragonflies always rest with wings outspread. I suggest these are damsel flies which look similar but rest with wings folded or only partly outspread. Thanks for pointing that out, David! I appreciate the information, and just yesterday when I was out with some family we saw a dragonfly and I was able to correctly confirm that it was indeed a dragonfly and not a damselfly precisely because of what I learned from blog commenters after posting this picture :) Thanks for reading the blog and for offering your input, and have a good day! That’s awesome, Carolyn! I’m so glad you have been able to go out and use your Nifty Fifty lens more often, especially with close-up filters. Keep up the good work, and I would be honored to have you link to my column in your post for the day :) Thank you so much! Thank you, Simon. You can see the post here: https://skip22037.com/2016/08/12/following-up-on/. Carolyn, I just read your blog post and that was so nice of you to mention me and Weekly Fifty. Those are some gorgeous shots of Mike’s flowers! Thank you Camille! I appreciate you sharing that pic also. You’re right, it’s hard to get good shots of these little fellas because they seem to go all over the place so quickly!